The Analyze command within E-DataAid allows the creation of tables and graphs of the data. To create an analysis, use E-DataAid’s Analyze command on the Tools menu to display the Analyze dialog, or click on the Analyze tool button. Activating this command displays the Analyze dialog. Variables are added to the analysis by dragging and dropping them from the Variables list to the appropriate lists on the dialog (i.e., Rows, Columns, and Data). Variables placed in the Rows list will have a row orientation in the table (i.e., their values will be listed down the rows of the table). Variables placed in the Columns list will have a column orientation in the table (i.e., their values will be listed across the columns of the table). Variables placed in the Data list define the data with which the table will be created. For example, in order to analyze the mean reaction time for congruent versus incongruent trials by participant in the Tutorial experiment, drag Congruence to the Columns list, drag Stimulus.RT to the Data list (selecting Mean as the summary statistic), and drag Subject to the Rows list. Once defined, click the Run button to perform the analysis. Analyze dialog (left) allows selection of variables for analysis. Table (right) generated from analysis specifications. The settings for the current analysis may be cleared by clicking the New button on the Analyze dialog. Alternatively, simply remove the variables from a particular list location by clicking a variable and dragging it back to the Variables list. The Analyze dialog will also allow the user to rearrange variables, or move them from one list to another simply by clicking and dragging. Count Number of times that a value occurs for the variable (numeric or string, provided that the string is not the string for missing data). CountNull Number of times that the value for the variable is equal to the string for missing data. CountNum Number of times that the value for the variable is numeric. Max Maximum value for the variable. Mean Mean value for the variable. Median Median value for the variable. Min Minimum value for the variable. StdDevP Population standard deviation for the variable. StdDevS Sample standard deviation for the variable. StdErrP Population standard error for the variable. StdErrS Sample standard error for the variable. SumSqrs Sum of squares for the variable. Total Total sum of all values of the variable. VarP Population variance for the variable. VarS Sample variance for the variable. 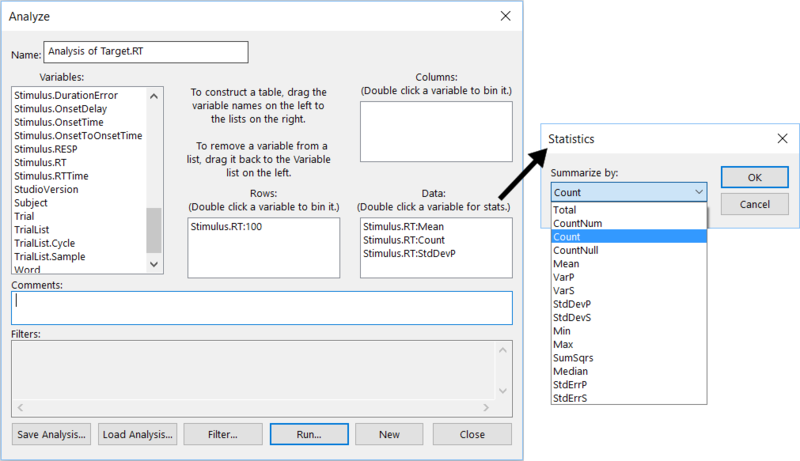 Change the statistic for a variable by double clicking the variable in the Data list to display the Statistics dialog. In the Statistics dialog, choose a statistic from the dropdown list and click the OK button. When a statistic is chosen, the variable displays the statistic after its name in the Data field of the Analyze dialog. To calculate more than one statistic for the same variable, add that variable to the Data list more than once. For example, to calculate the count, mean, and standard deviation for a variable, drag and drop the variable from the Variables list to the Data list three times. Change one occurrence to Count and one to StdDevP (one occurrence will already be Mean by default). It is possible to group, or bin, a variable in an analysis. For example, when creating a distribution of response times, it may be beneficial to bin reaction times by groups of 100 ms. Any numeric variable in either the Rows or Columns list of the Analyze dialog may be binned by double clicking the variable to display the Bin dialog. In the Bin dialog, enter an integer from 1 to 32,767 and click the OK button. Binning the variable by 1 is equivalent to not binning it at all. A variable binned by more than 1 will display its bin number after its name. Once the analysis has been created, run it by clicking the Run button on the Analyze dialog. E-DataAid displays the results in table format as displayed above. The table may be copied to the clipboard, exported to a text file, plotted in Excel, or copied to Excel or export to StatView/SPSS. Once the parameters for an analysis have been set, the analysis may be saved so that it need not be recreated. To save an analysis, click the Save Analysis button on the Analyze dialog. If the experimenter provided a name for the analysis, the name will appear in the Save As dialog; otherwise, a name must be entered. Analyses are saved in text file format with the .anl extension. These text files can be read by E-DataAid using the Load Analysis button on the Analyze dialog. When E-DataAid saves an analysis, it saves the configuration for the analysis, the spreadsheet’s filters, the table’s options, and the plot options if applicable. When reloaded, E-DataAid reapplies these items. Saving an analysis does not save the results of the analysis. To reproduce the results of an analysis, the analysis must be reloaded and rerun. After saving an analysis, it may be loaded for rerunning by clicking the Load Analysis button on the Analyze dialog. The application will prompt the user for the name of the analysis file. 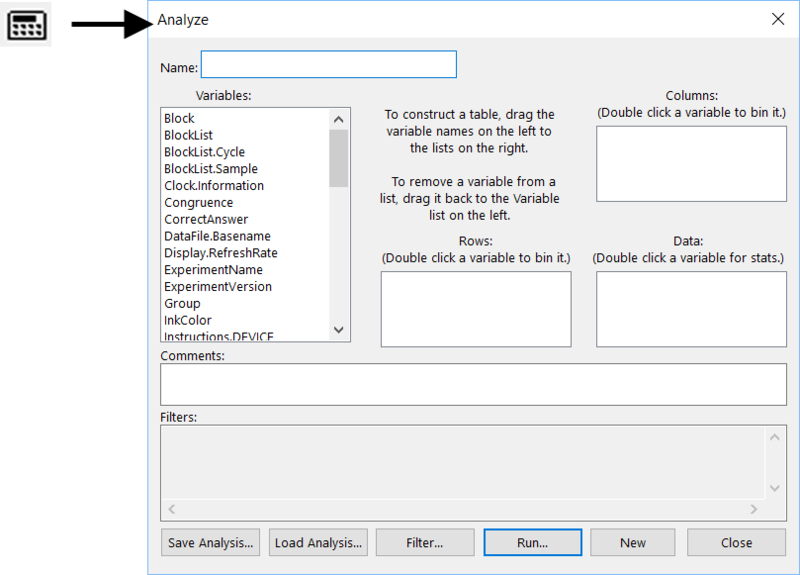 In addition to loading the configuration for the analysis, the application reapplies the saved filters, table options, and plot options, if applicable. Once loaded, the analysis may be performed by clicking the Run button on the Analyze dialog. To run multiple pre-saved analyses, use E-DataAid’s Batch Analysis command on the Tools menu. 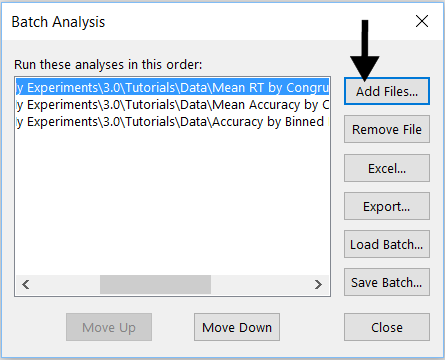 Within the Batch Analysis dialog, use the Add Files button to select the individual analyses to include in the operation. The Batch Analysis command allows the user to run a batch of analyses in rapid succession without individually loading and running each analysis file. After selecting all analyses, click the Excel button to create tables in Excel (shown below), or the Export button to export the tables to a text file. If the Excel option is chosen, the individual analyses are written to separate worksheets within the same workbook. For additonal information, see E-DATAAID: Batch Analyses .